"Box the compass backwards from South East by East, a Quarter East". Before you shipped out from the Prince of Wales Sea Training Hostel you would know how to 'box the compass' both backwards and forwards. (Never mind that when you actually get to steer a ship, you find that they use degrees, not compass points). You would also know that 'shell, shave, bush, pin and crown, arse, swallow and score' were all parts of a block, of Block and Tackle fame. You learnt how to use a palm and needle, and the little trick of cutting out a round bottom for the sea bag that you use when you left the hostel. Mainly though, you learnt discipline. When a boy, often younger than yourself, told you to keep scrubbing the deck until he told you to swab off; you kept scrubbing or felt his ropes end on your rear end. Having been a Sea Scout for several years, I expected the six month tour at Limehouse to be a cake-walk. Its wasn't! 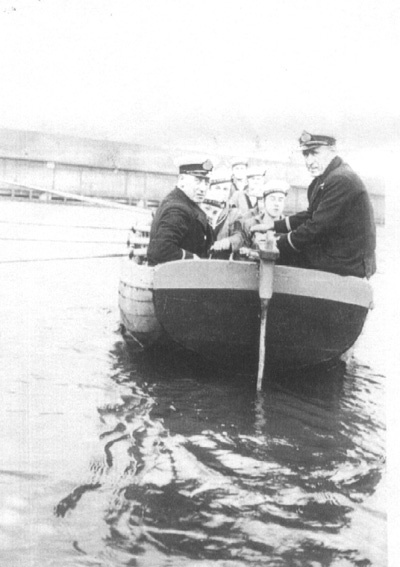 The school, or hostel as it was then called, was located in the heart of the dock area, and we would be marched down to the docks by Mr Painter and Mr Frost (two of our instructors) to receive rowing and boat handling instructions, using two ship's lifeboats. We were always glad to get to the docks and then to get back home afterwards, as the area that we marched was not the choicest. Swimming practise was held in our own indoor pool, and was probably the first and only times that we swam in the buff. Our parade ground had a fully rigged mast (and topmast), and part of our exercising would be to go 'up and over'. Up the ratlines on one side, and down the other, with no dilly-dallying on the way. We had around 50 boys and were divided into two watches, with Mr Painter heading up one and Mr Frost the other. I believe they both were daytime instructors only, going home at night. Mr Elgar was the resident instructor, living at the hostel. I recall a Matron and a Chief Officer who also lived elsewhere and came in daily. Weekends were free for our own individual activity, and I was able to go home occasionally as I lived in Barnes, a number 9 bus ride away. We used to say that we had more Scots than English and more Irish than Scots, so obviously most of the boys stayed at the Hostel over the weekends. There was considerable completion between the two watches, and also in each watch, in trying to gradate from deck scrubbing and toilet cleaning to Petty Officer and Chief Petty Officer. Maybe we didn't really need to be able to box the compass, or know all the parts of a block, but when we left the hostel we were very well trained for the life ahead of us and the powers that be had no trouble finding berths for us.